World's Best Garden Buffet II: A crispier version of the Garden Buffet blend. A healthy, nutritious supplement for all exotic birds and other pets. Contains herbs and vegetables. The flowers of Hibiscus and Chamomile flowers have been used since ancient times in herbal teas for their calming and relaxing properties. Also available per 1/2lb. Directions: Serve dry or moistened by adding sterilized or purified water. Water can be added hot or cold to Garden Buffet II. Allow to rehydrate overnight if the water is cool. If the water is hot the “rehydration process” will be achieved once the product has cooled. 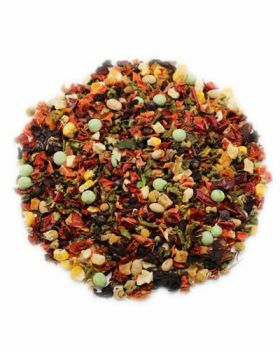 Ingredients: Sweet Potatoes, Carrots, Beets, Crispy Apples, Freeze Dried Corn, Red and Green Sweet Peppers, Freeze Dried Peas, Soybean, Juniper Berries, Tomatoes, Green Cabbage, Hibiscus Flowers and Chamomile Flowers. Notify me when Garden Buffet II Per 15lb- World's Best is in stock.